Windows 7 by design does not support multiple audio output and that is the limitation that many Windows 7 users are not happy with. Some people may want to play sound simultaneously to both speaker and earphone but that is not possible. Once you’ve plugged in the earphone, Windows 7 automatically recognizes it and routes all sound to the earphone. For more complicated scenarios such as wanting to output the sound from a computer game to the earphone while the main speakers plays music from a media player, then it would seemed even more impossible. Thanks to Virtual Audio Cable, it offers multiple possibilities on how you want to transfer the audio streams between applications and/or devices. Before immediately scrolling to the bottom of this article to download and install Virtual Audio Cable, please be noted that this tool does not work alone just under operating system control. It requires configuration and also must be worked together with audio applications. The official website of Virtual Audio Cable contains a lot of text and jargon which makes it difficult for any non-audiophiles to configure and use it. After spending some time trying out VAC, I personally believe it is best to try to get it working on one or two scenarios to understand how it works, then only configure it to work with your situation. 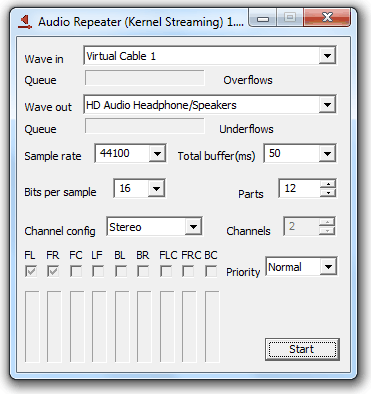 Scenario 1: Output audio from Windows Media Player to both speakers and earphone. 1. Download and install Virtual Audio Cable. By default Virtual Audio Cable already creates 1 virtual cable. You can verify this at the Virtual Audio Cable Control Panel. There is no need to touch any of the settings at the VAC control panel. 2. 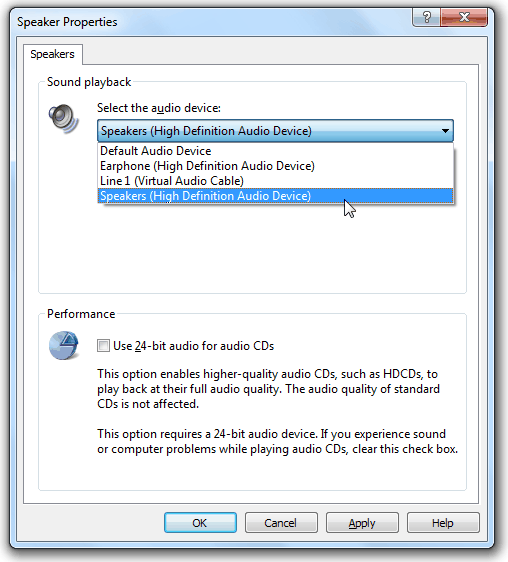 You have to configure Windows Media Player to use the Virtual Audio Cable as the default audio device for sound playback. You can either set this globally by going to Windows Control Panel > Sound > set Line 1 as the default device OR individually at Windows Media Player Tools > Options > Devices tab > select Speakers, click the Properties button and set Line 1 (Virtual Audio Cable) as the audio device. Which method you should use depends on the software if it allows you to set the individual audio device for the program. We’ll use the global method in this scenario. 3. 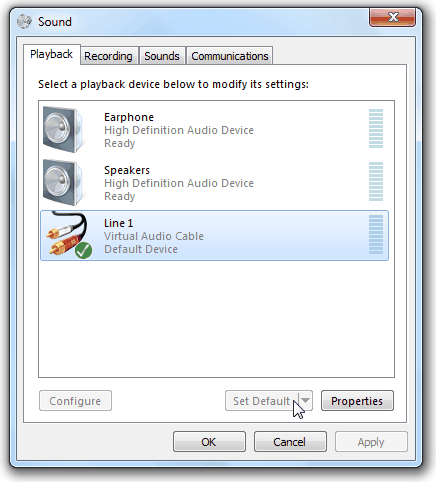 After setting Line 1 as the default audio device, playing any music from Windows Media Player won’t have any sound because we haven’t configure the Line 1 to output to which device. Now run Audio Repeater (KS) shortcut from Start menu. The most important configuration here is the wave in and wave out. Wave in will be Virtual Cable 1 and Wave out as HD Audio Headphone/Speakers, then click the Start button. This audio repeater will now route all sound from Cable 1 to your earphone. 4. 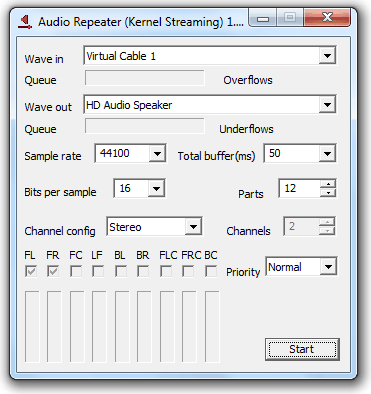 Run the Audio Repeater (KS) shortcut AGAIN from Start menu, select Virtual Cable 1 as wave in , HD Audio Speaker as wave out and click the Start button. You may have already guessed it, this repeater routes Cable 1 to your speakers as well. 5. Play any music at Windows Media Player and you should hear the audio on your speakers and earphone as well. Scenario 2: Output music from Windows Media Player to speakers and Plants vs. Zombies game sound to earphone. 2. We will configure Windows Media Player to use the speakers as sound playback. Go to Tools > Options > Devices tab > select Speakers, click the Properties button and set Speakers as the audio device. 3. Since Plants vs. Zombies doesn’t allow us to select which audio device to use, we are forced to set Line 1 as the default audio playback device so that we can use Audio Repeater to route the game sound to the earphone. Go to Windows Control Panel > Sound > and set Line 1 as the default device. 4. Run Audio Repeater (KS) shortcut from Start menu. Select Virtual Cable 1 as wave in, the Earphone as wave out and click the Start button. 5. Now you can play music from Windows Media Player which will output the sound to the speakers but the sound from Plants vs. Zombies will be sent to your earphone. For more examples, you can view the Examples content from Virtual Audio Cable help file. Virtual Audio Cable supports Windows XP/2003/Vista/Server 2008/Win7 platform (32-bit and 64-bit). The trial version supports up to only 3 cables and adds female voice reminder each several seconds. The full version of Virtual Audio Cable cost $30 USD. I followed your instructions exactly, but every time I open the Audio Repeater KS and click “start” this blue screen appears saying error with your recent installation and forces me to force-shut down my computer used the keyboard button. If I try and use skype before your Audio Repeater KS step (just setting AC Line 1 as my default playback, etc.) then I hear this horrific screeching noise and my skype caller doesnt hear anything! Please help?! I have a 64bit computer (not sure what that means, but I think it is relevant?). Thank you very much for this tutorial ! It worked perfectly with my Samsung HD TV ! ! I have been searching for a solution for quite some time ! I’m trying to set this so when I play a game, my other audio sources automatically output from the other speakers. The point of this is to be able to watch youtube walkthroughs as I play without losing sound from one application. You Sir, are a god amongst men. Thanks very much for the guide, very intuitively written. Will definitely recommend this site. where to buy the cable??? As already mentioned, sometimes VAC have latency through its audio channel. Also from what I felt when I tried it, the sound quality degraded a bit. So unless you’re totally in need to have two audio outputs running at the same time, I wouldn’t recommend it. What if you don’t have Windows Media Player? Can I use this seemingly nice software with VLC? Cheers Raymond, I always wondered how to do this! VAC is a nice solution but it introduces a little latency/delay for the audio. Not a big problem though. Microsoft should never have redesigned the audio stack in Vista with this limitation. They also took away hardware acceleration of audio/MIDI and surround sound in games. I was looking for something like this…..